Ten years ago, the thought that video games would be treated with respect as an artform in academia was unheard of. Now, the Princeton Review ranks schools for game design, the School of Cinematic Arts houses thinklabs and advanced-level courses in video game design and the National Endowment for the Arts granted Tracy Fullerton, the Chair of SCA’s Interactive Media Division, funds to finish Walden, a game. Game design has become a pervasive part of the entertainment industry, and on September 12th and 13th, Sony Computer Education America will be holding two days of events, including an talk from CEO Jack Tretton, which will further the reaches of the game industry and solidify the relationship between PlayStation and USC. Two tents will be set up just outside of the George Lucas Building on Watt Way at the USC Campus. The event will culminate with a keynote address from Tretton at 11:00 AM on the 13th. The specifics to the events are listed below. PS3 and PS Vita Gaming Stations will be placed outside the George Lucas Building on Watt Way. PlayStation HR Reps will be on-site September 12 & 13; drop off your resume and find out about what great opportunities PlayStation has to offer. Tents: 20 gaming kiosks featuring New and Pre-Released Games such as PlayStation All Stars: Battle Royale, LBP Karting, Madden 13, NHL 13 and more. Swag includes PlayStation bottle openers, PlayStation Koozies, PlayStation Cups, PlayStation Sunglasses, Bracelets, Backpacks and more, free PS Plus 30-Day Trial Cards and more. Sep 13: 11 AM - 12 PM Keynote speech from Jack Tretton, the CEO of Sony Computer Entertainment America in SCA 108. 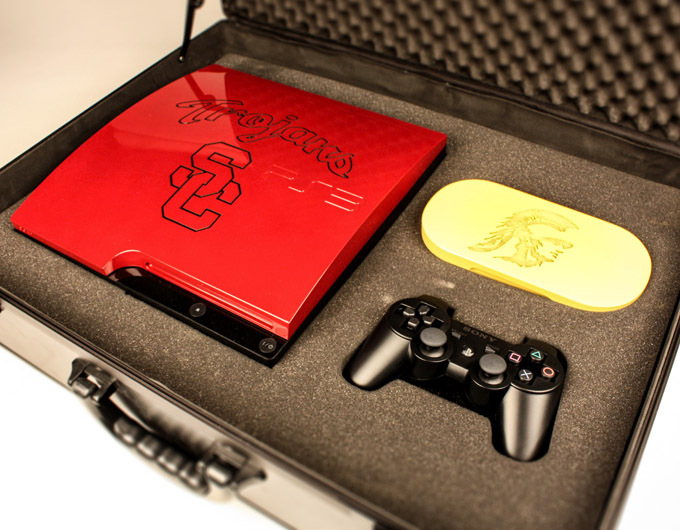 - Custom USC PS3 and PS Vita will be given away. PS3 and PS Vita will feature an etched USC logo. - PS MLB 12 Prize Pack: PS3, MLB 12 The Show, Move Software Bundle. - Sep 12: 10 AM to 2 PM Compete at the tents on PlayStation All Star: Battle Royale contest for your chance to win the Custom Etched PS3 and PS Vita prize pack. Be sure to register at the truck via Play Wish Win system. Ask a PlayStation Crew Member for assistance. Sign ups will take place on both 12th and 13th.